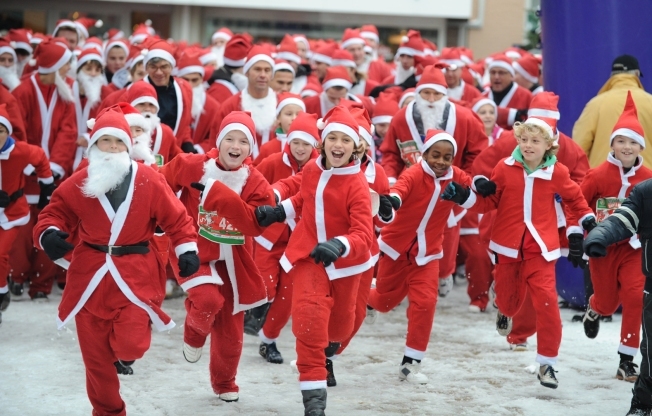 Register now for the TiVo Santa Run Silicon Valley! Festivities kick off at 1:00PM on race day Sunday, December 18, 2016. The 5K run/walk starts at 3:00PM and is perfect for the whole family. Bring the kids ages 2-7 to participate in the Kids Fun Run. The Santa Run Silicon Valley was founded to contribute to local programs for the ever popular Christmas in the Park, Downtown Ice, and Reading Partners. We encourage you to dress up as your favorite holiday character or tradition! The streets will be filled with Santas, Mrs. Claus, the Grinch, reindeers, elves, menorahs; the ideas are limitless! Come and join us for an exciting and festive race where each participant will receive a finisher medal for the 5K, a sneak peek of the costume contest, and don’t forget to donate a children’s book for the holiday book drive!